Ravine is simple tower defense game from unknown author sponsored by Armor Games and Axis Games. 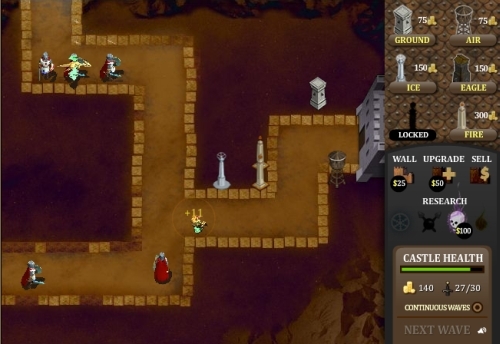 In the game you must protect your castle from attacking enemies. Ground Tower is basic tower for ground enemies. Air Tower is basic tower against air enemies. Ice Tower is effective on both types of enemies and it slows enemies. Eagle Tower is average weapon against both type of enemies. Poison Tower is effective on both types of enemies. It has low damage but it has long lasting. Fire Tower is the best tower in the game suitable for both types of enemies. Tower can be upgraded more times or sold. Towers are also upgraded in automatic mode after reaching some amount of killed enemies. Ravine has standard game engine. What I don't like on this game engine, is system of upgrades and sellings. You must choose action button at first and then select tower. It is sometimes a little bit confusing. When you simply click on towers, you can change type of targeting for towers. The game has a good graphics and average sounds. The game is sometime a little bit difficult, but it has a good playability. Ravine is nice tower defense game with good playability. I am giving this game 6.5 from 10 points.